What Is A DS-82 Form? A passport is definitely the most important document for all people. It identifies the personality and provides the basic information. Losing or damaging it may lead to so many troubles. However, when it happens, you have no choice but to renew it as quick as possible. To make it easier, we offer to check Form DS-82 which is specially designed for such purposes. 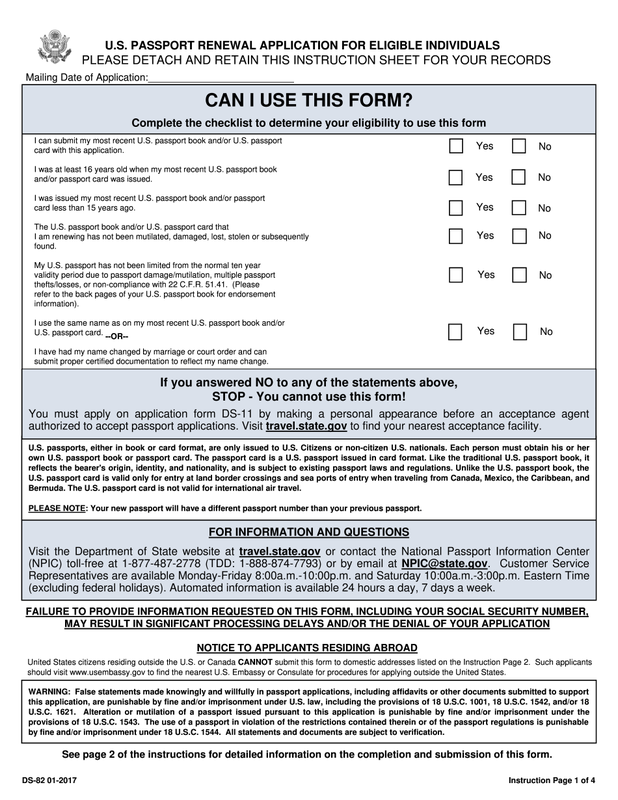 Using this form, you may request renewal of the passport by mail. You will spend approximately 40 minutes to complete it, however, you may do it faster if you check the instructions on our site. Pay attention that you cannot claim renewal by mail if the passport was greatly damaged, issued to a minor aged individual, or issued to you more than 15 years ago. For this purpose, use Form DS-11. You can save plenty of your time, filling out a DS 82 on our site. Do not worry about possible mistakes you can make while completing it as you have a great chance to edit the document as you want. Add more fillable fields if you need additional spaces for some information and include all necessary details to your PDF. An online form that you can either download anywhere on the Internet or just find on our site is much more convenient and user-friendly. The U.S. Passport Renewal Application for Eligible Individuals is a specific form and it is difficult to complete it properly on the first try. Generally, there are 2 sections. In the first section, an applicant must provide the personal information. It includes the date and place of birth, your full name, gender, email address, social security number, and your telephone number. It is required to attach the photo. Additionally, if you have recently changed the name, you must provide the information about it on the first page of our DS-82. The second section of the DS-82 Application Form for a Passport Renewal is devoted to the details about applicant’s physical parameters. Indicate your height, eye and hair color, school or employer, occupation, additional telephone number, emergency contact, permanent address, and travel plans. You can simply skip the field for travel plans if you do not have any. Make sure you provide the valid information and carefully fill out Form DS-82. Illegible writing or any error can lead to the rejection of your request or processing time delay. Look through the completed form one more time before sending it and correct all mistakes. Do not worry, editing will take several minutes as all our tools are aimed at the user’s convenience. Generally, the procedure of processing the application takes about 6 weeks.